Please note that traffic around Walt Disney Concert Hall may be disrupted by a march and rally led by United Teachers of Los Angeles. Please allow yourself extra time to get to our concert an consider public transportation. Don't want to drive? Learn how to take Metro Rail to Los Angeles Master Chorale concerts by clicking on the TripPlanner. The site will map your route from home to the Music Center as well as provide fare information and arrival & departure times. Walt Disney Concert Hall is located closest to the Red/Purple Line Civic Center Metro stop at 101 S. Hill St. (southwest corner of First and Hill). The MTA provides a helpful TripPlanner for those using public transportation. The Civic Center station on the Red Line is the closest, just to the east of Walt Disney Concert Hall. For information on bus service to the Music Center, please contact the MTA at 1-800-COMMUTE or visit their website: www.mta.net. Santa Monica's Big Blue Bus now offers weekend service. Click here for their website. 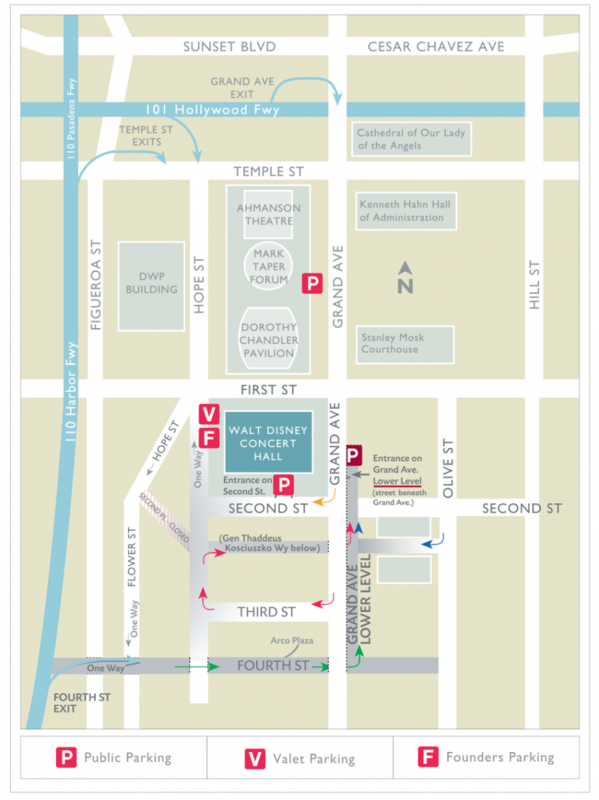 Parking is available directly beneath Walt Disney Concert Hall. Enter on Second Street or Lower Grand Avenue. Regular parking costs $9 beginning at 4:30 p.m. for evening concerts; two hours before weekday matinees; and all day on weekends. Both the Second Street and Lower Grand entrances will be open 6:00am to midnight, Monday through Friday, and 7:00am to midnight on Saturday and Sunday. Valet parking is available for $23 at the Hope Street entrance, beginning at 5:00 p.m. for evening concerts, two hours before weekday matinees and all day on weekends. The Hope Street valet and Founders parking entrance will open three hours before each concert. Accessible parking spaces for vehicles displaying valid, state-issued disability parking placards or license plates are reserved near the elevators on each level. For questions or problems regarding Music Center parking, please contact Classic Parking at 213-972-3476.